What Explains Trump’s Sharp About-Face on Saudi Arabia? It has more than a little to do with the power of the Saudi lobby—as well as the administration’s deep hostility toward Iran. On his first overseas trip as president, Donald Trump traveled not to Canada, or to Mexico, or to Britain, or to France, but to Saudi Arabia, where he was, to his obvious delight, greeted like a king. 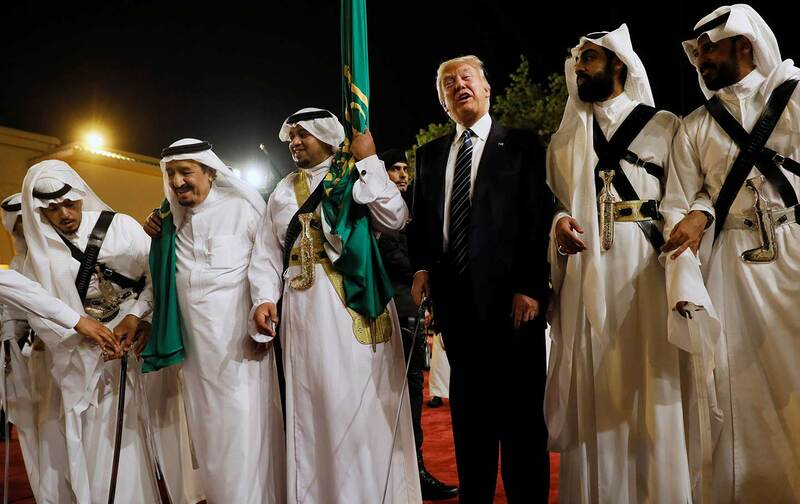 According to a New York Times report from Riyadh, “The Saudis treated him like royalty, with red carpets, lavish meals and American flags flying everywhere.” During his two-day visit to the Wahhabi Kingdom, Trump was awarded a gold medal, danced along with Saudi swordsmen, and made time to sign a series of agreements with Saudi King Salman, which included a new arms deal totaling $460 billion over 10 years. But once in office, Trump’s criticisms were quickly muted. By February, CIA director Mike Pompeo had traveled to Riyadh to bestow the George Tenet Award upon the kingdom’s interior minister, Crown Prince Muhammad bin Nayef. And soon enough, reports were emerging of a Pentagon plan that would increase US support for the Saudis’ grotesque war against Iranian-backed Houthi rebels in Yemen. So what explains the turnaround? The ease with which Trump abandons previously held positions is by now well known. But another factor that explains the turnaround is the power and skill of the Saudi lobby in reinforcing the already deeply entrenched view that US national interests are best served by an alliance with Riyadh in order to check Iranian influence in the region. From its earliest days, the Trump administration wasted little time in signaling that it would soon be turning President Obama’s Middle East policy, which could be characterized by a wariness of the Saudis and a willingness to negotiate with the Iranians, on its head. Focusing on Iran to the exclusion of all else also has the benefit of appeasing the Israelis. Stahl: I have to ask you, because it’s the most fascinating of all: Israel and Saudi Arabia. Are you actually developing an anti-Iran alliance in the Middle East? Netanyahu: Doesn’t have to be developed. It’s there anyway. The Iran obsession diverts the American public’s attention away from the depraved nature of the House of Saud. The focus on Iran also helps to divert the American public’s attention away from the depraved nature of the House of Saud. Over the past several years, it has become clear that the values of the kingdom (to say nothing of the methods it chooses to enforce those values) are far closer to those of ISIS than to those of the United States. According to Human Rights Watch, the kingdom beheaded 19 people—one of whom was executed for the crime of “black magic sorcery”—over the course of 16 days in August 2014. Other crimes punishable by death in Saudi Arabia include adultery, atheism, and apostasy. According to news reports, in 2015 Saudi Arabia executed nearly 160 people and in the process beheaded more than twice the number of people that ISIS had that year. American Middle East policy rests upon a deep, willful misreading of the geopolitics of the region. Given all of this, it is hard not to conclude that American Middle East policy rests upon a deep, willful misreading of the geopolitics of the region, which sees the Saudis and their Gulf allies as US-friendly bulwarks against a revanchist Iran. In fact, according to the respected Middle East expert and former State Department official Vali Nasr, the opposite is true. Over the past year, Saudi Arabia acquired the services of many powerful DC lobbying firms. What else might explain America’s responsiveness to the whims and wishes of the Wahhabi Kingdom? Access to oil markets, certainly. But so does the Saudi government’s robust lobbying efforts in Washington. According to the most recent FARA (Foreign Agent Registration Act) filings at the Justice Department, over the past year Saudi Arabia acquired the services of powerful DC lobbying firms such as the Podesta Group, Squire Patton Boggs, the Glover Park Group, Burson-Marsteller, and Hogan Lovells in clear anticipation of the coming post-Obama era. In recent months Saudi Arabia has also hired Hogan Lovells and the firm of lobbyist Richard Hohlt, both of which agreed to lobby “US Government officials, Members of Congress and their staffs” on issues ranging from “Middle East regional security” to “counter-terrorism.” For its work, Hogan Lovells will receive $375,000 on a quarterly basis. But like a number of recent filings reviewed by The Nation, the amount Hohlt is to receive from the kingdom was not disclosed. A pro forma declaration stating that the “Duration, fees, and expenses have not been determined as of time of submission” mark a number of recent FARA filings relating to the Saudis. The dissemination of Saudi propaganda around Washington is a key aspect of the job. Opensecrets.org obtained e-mails sent by Hogan lobbyist Ari Friedman, who promoted a February 2017 issue of Saudi Arabia In Focus, a newsletter produced by the Saudi information office in Washington. In it, readers are informed that Saudi Arabia is a “Pillar of Stability” in the region and that, for the Saudis, “Safeguarding Civilians in Yemen Remains a Priority.” A January 2017 e-mail to dozens of congressional staffers by the Podesta Group’s David Adams stressed King Salman’s “commitment to fighting terrorism.” It is worth noting in this context that Adams had previously served as assistant secretary of state for legislative affairs under Hillary Clinton. Yet not all pro-Saudi propaganda is bought and paid for; some spread it because they actually seem to believe it. Take neoconservative columnist Bret Stephens, for example. In a column for The Wall Street Journal in January 2016, Stephens wrote that because the Saudis feel “acutely threatened by a resurgent Iran,” the right US policy would be “to hold them close and demonstrate serious support, lest they be tempted to continue freelancing their foreign policy in ways we might not like.” Appearing on MSNBC’s Morning Joe in September 2016, Stephens admonished Kentucky Senator Rand Paul for expressing reservations about our friends in Riyadh. “We should be extremely grateful to have Saudi Arabia as an ally,” admonished Stephens. Stephens’s thinking, such as it is, is typical of what passes for strategic analysis within the media/think-tank echo chamber, where Saudi Arabia is relentlessly painted in the best possible light. The nexus of Saudi money, bought and un-bought influence, and the resulting barrage of pro-Saudi propaganda combines to obscure the simple but ramifying point that the Saudis are not our friends. Yet the prevailing climate of opinion in Washington, shaped by these forces, maintains that Saudi Arabia (the funders of Al Qaeda, facilitators of ISIS, perpetrators of war and famine in Yemen) is, as they themselves claim, a “pillar of stability” in the Middle East. There are many troubling aspects of Donald Trump’s still-young presidency, but his warm embrace of Riyadh this weekend might be the most troubling of all.